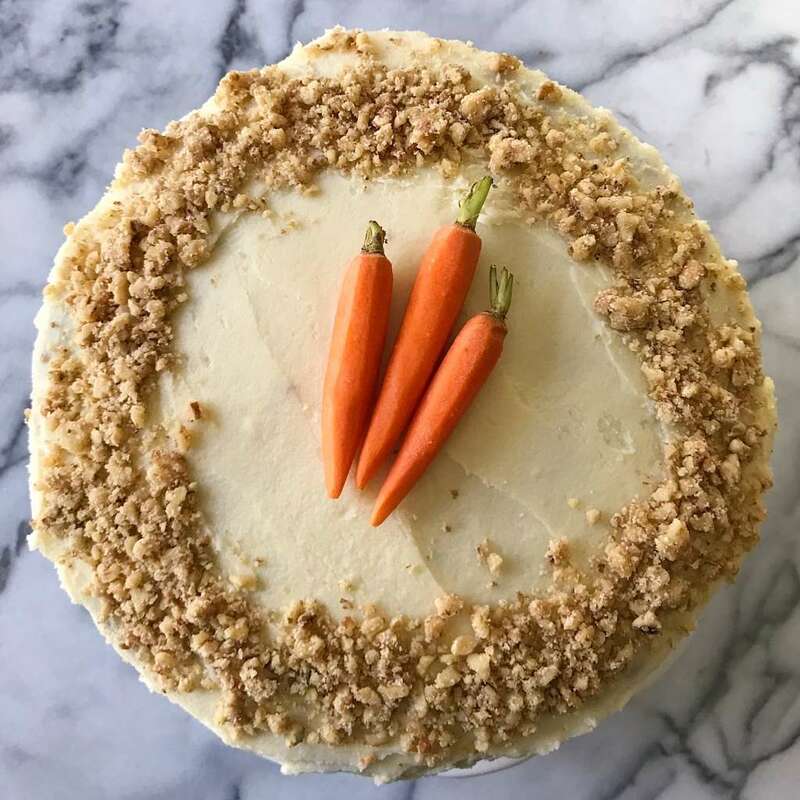 Combined two family recipes to create the yummiest Gluten-Free Carrot Cake with Cream Cheese Frosting ever! Moist, Flavorful and a total crowd pleaser! Hands down winner after many, many taste tests! Is there any more iconic Spring dessert than carrot cake? 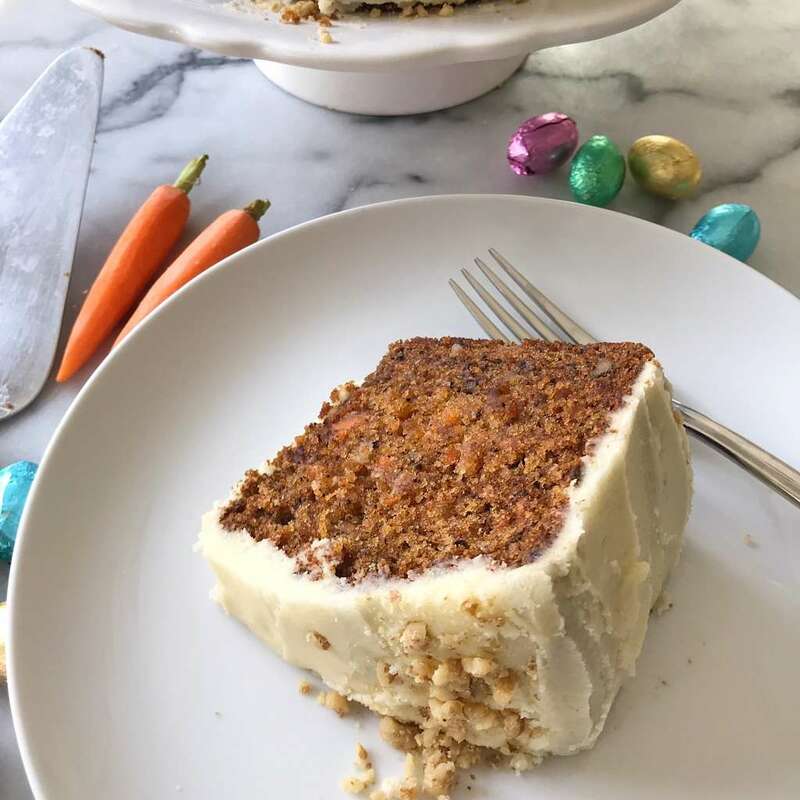 With one week till Easter, we are finally sharing my family’s recipe for the BEST Gluten-Free CARROT CAKE with Cream Cheese Frosting! 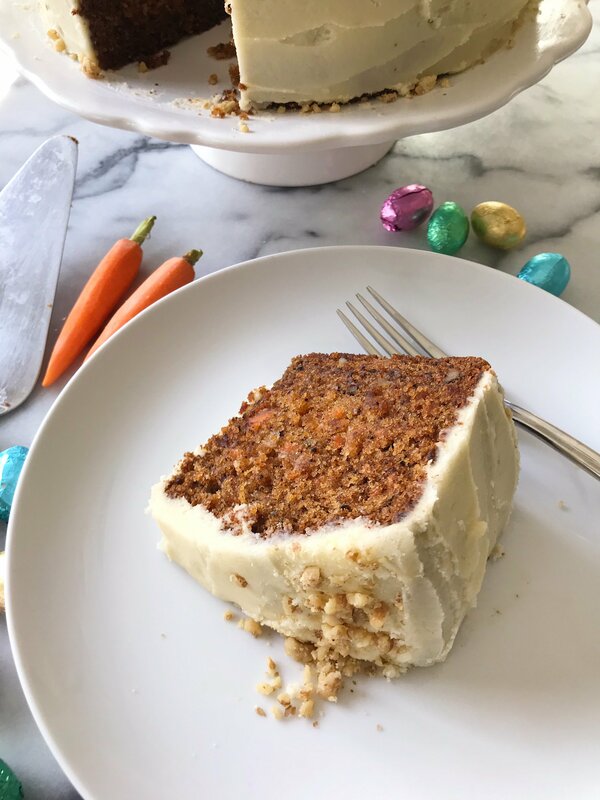 Several in my extended family (including me) love carrot cake and we have a taste tested countless recipes over the years and most recently in the last few weeks… This one developed by my mom is the hands-down winner. It is a combination of my Grandmother’s and my husband’s Aunt Anne’s recipes and it is 💯. The best texture –soft and moist, and the best flavor– just the right amount of sweetness. And the cream cheese frosting is so yummy! Plus, it is one of the easiest cakes to make! Plus it can be made in as a double layer cake, in a tube pan or even a 9×13 in pan, whatever works for you! And it’s made with real, whole food ingredients. 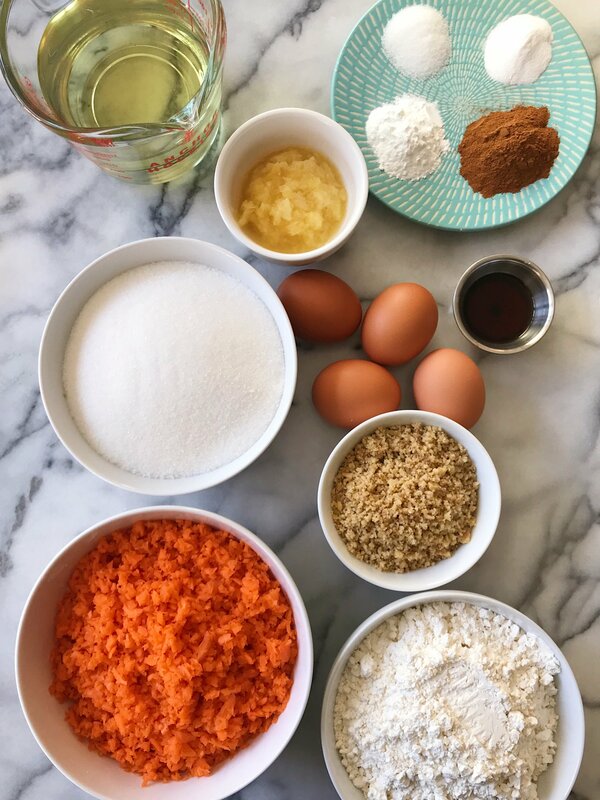 For the cake you’ll need grated carrots, eggs, sugar, oil, baking powder, baking soda vanilla extract, cinnamon, gluten-free flour (we used GF Jules, affiliate link), pineapple chunks (only 1/4 cup!) and chopped walnuts (omit if nut free). 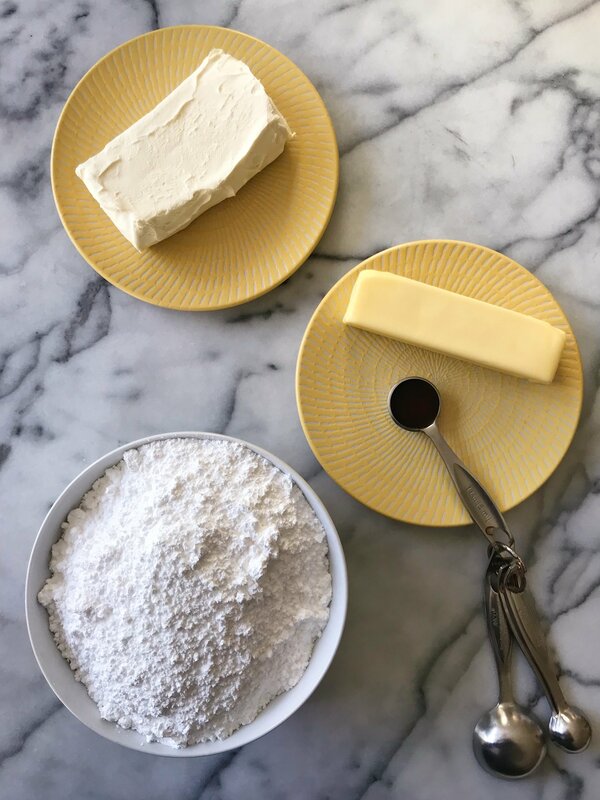 For the frosting you’ll need confectioner’s sugar, cream cheese, butter or dairy free butter and vanilla extract. 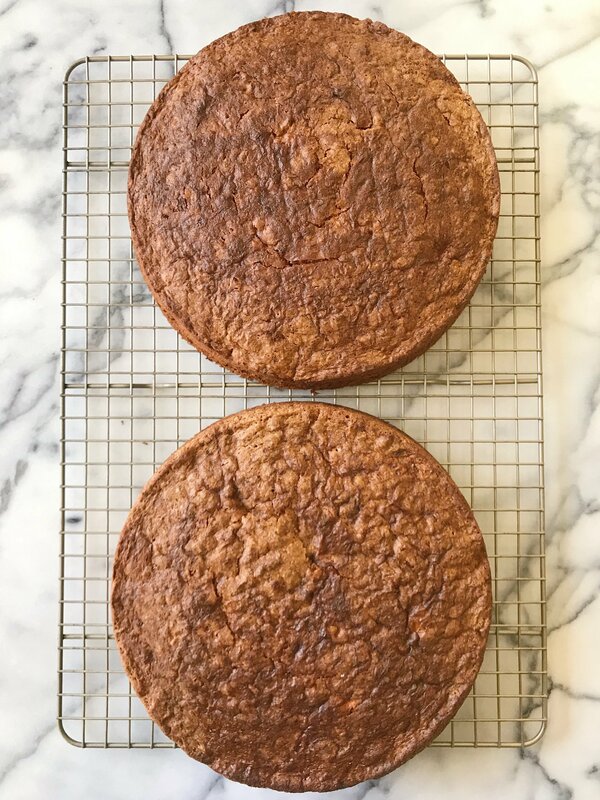 Whether you’re making the cake in tube pan or 2 round pans ( I actually used 2 9″ spring form pans because I find it easier), one I find it helpful to cut out a piece of parchment paper in the shape of the bottom of the pan. Then grease the parchment paper along with the rest of the pan. This will allow the cake to come out of the pan cleanly. You just peel back the parchment paper after baking. See how clean they come out of the cake pans? Next up… my favorite part… cream cheese frosting! The frosting is a classic… confectioner’s sugar, cream cheese, butter and vanilla extract. It is creamy, smooth and delish! 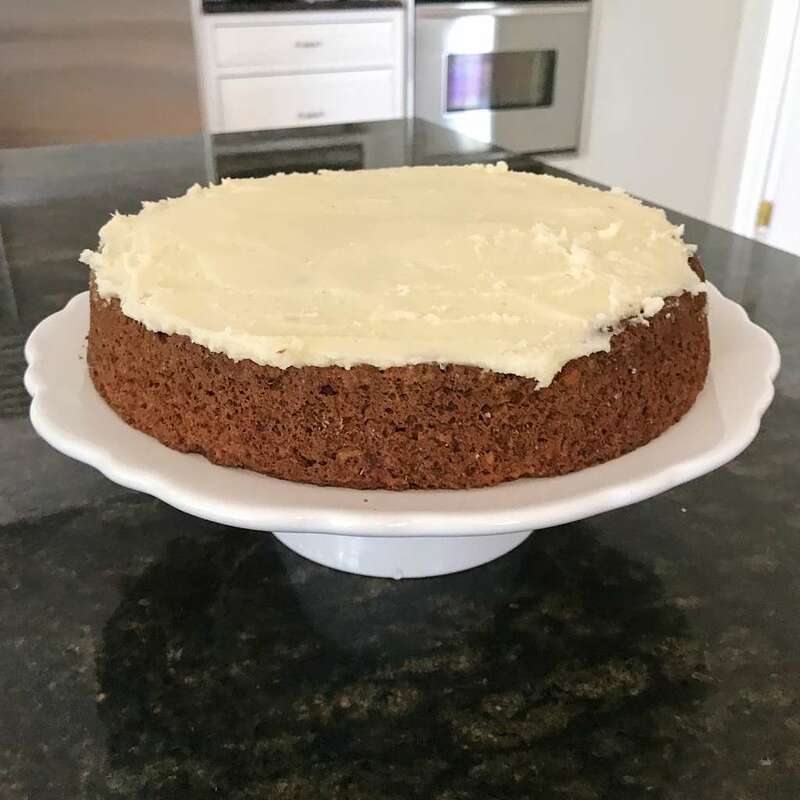 If frosting a double layer cake, I like to start by frosting the top of one cake, then placing the second cake on top, frosting the top and then the sides. You can feel free to decorate is any way you like… sprinkle with walnuts, top with some carrot sticks or jelly beans or just eat as is! 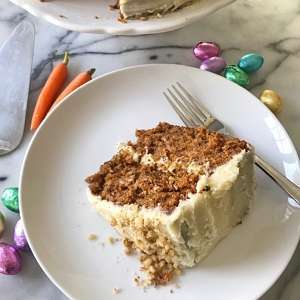 Looking for more Easter recipes and idea, click here to see our picks. 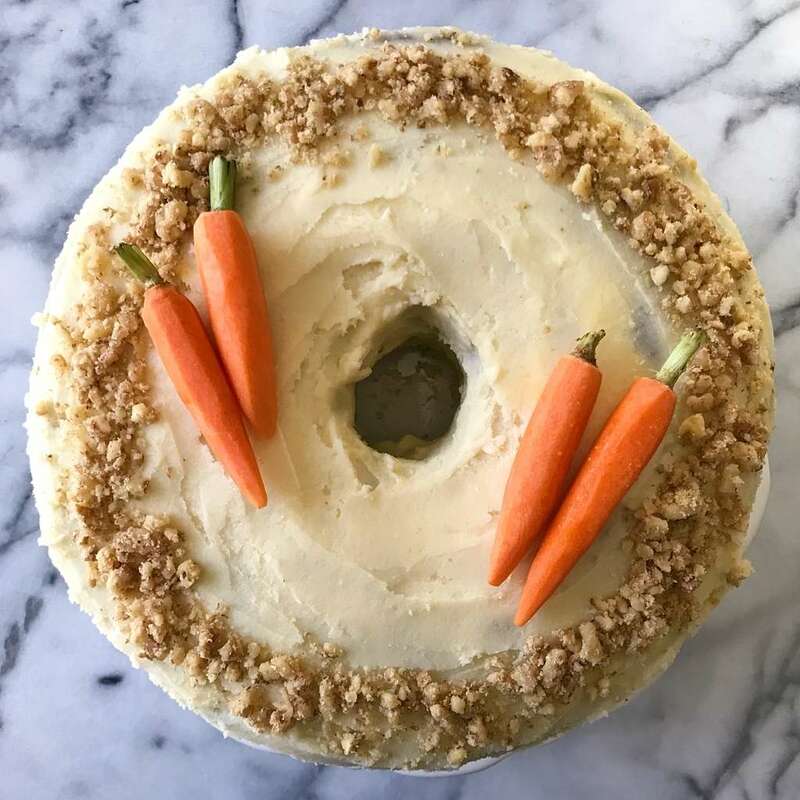 This recipe is a combination of two family recipes and is the best gluten-free carrot cake hands down! Super easy recipe can be made in a tube pan, 9 x13 pan, or a double layer cake using 2 9 inch round or springform pans. Preheat oven to 350 degrees F and Grease pans. 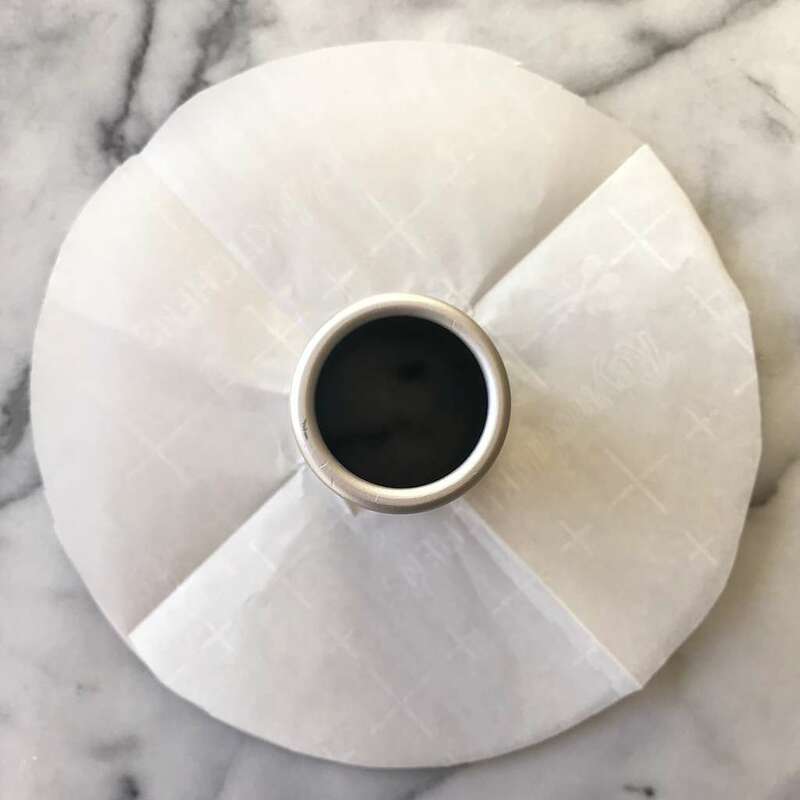 If using tube pan or round cake pans, cut our parchment paper to fit the bottom in the shape of the circle. Grease the parchment paper well too. This will make it easy to removed cake from pans. Mix oil and sugar thoroughly in mixer. Add eggs one at a time, beat thoroughly after each addition. Combine flour, baking soda, baking powder, cinnamon and salt in a bowl with a pastry cutter or fork. Add dry ingredients alternately with the grated carrots to the wet ingredients. Add vanilla and drained pineapple. Mix thoroughly. Add walnuts and raisins if using. Again, beat thoroughly. Bake at 350 for 30-40 mins if baking the 2 9 inch cakes. Bake at 50 - 60 min if baking the tube or 9x13 inch cake, or until a cake tester comes out clean. 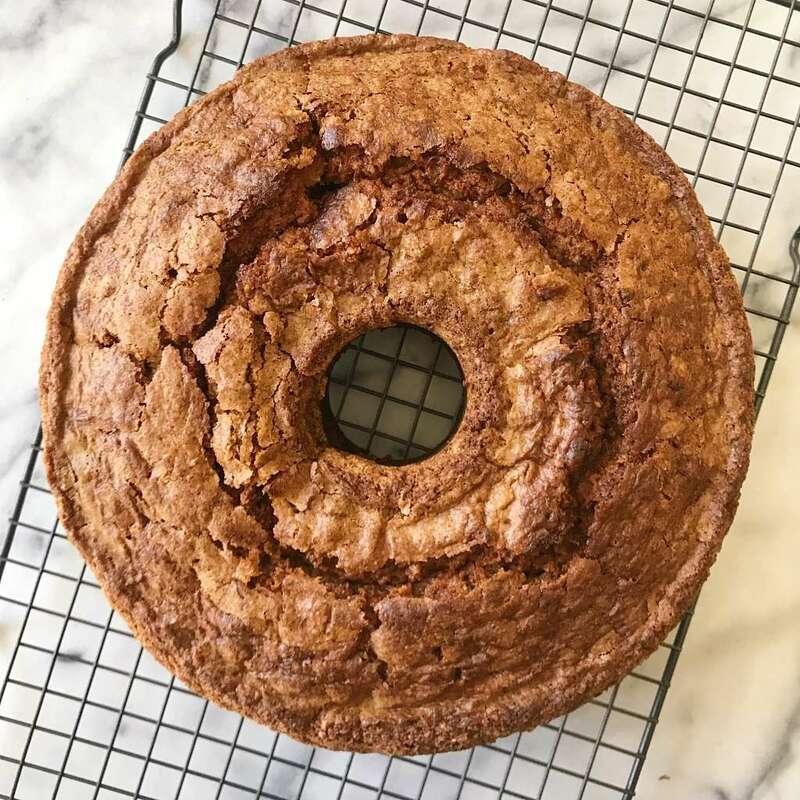 As with all Gluten-free baking, if you feel the top is browning but the center isn't fully cooked, cover loosely with foil and continue to bake. Let cool completely before removing from pan(s) and peel back parchment paper off the base of the cake. Cream all ingredients together and frosting on cake once cake is baked and cooled. 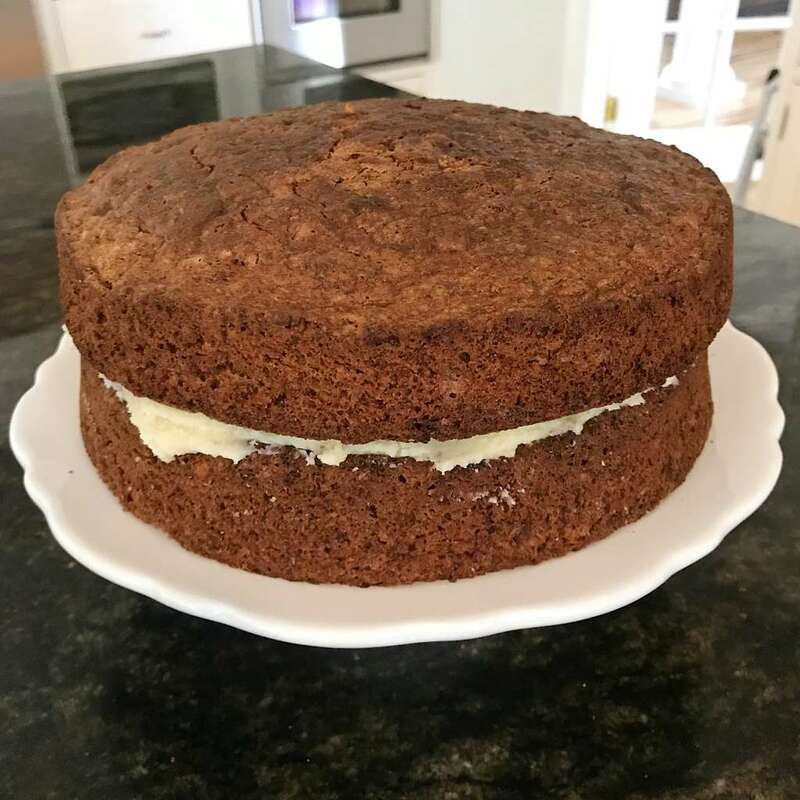 If frosting a double layer cake, frost the top of the bottom cake, then place the second cake on top, frost the top and then the sides.